As the son of an old-time, house call-making General Practitioner, Dr. Sheldon B. Greenberg has been involved with medical care for almost his entire life. Dr. Greenberg made his first house call at the age of two and wanted to be a doctor ever since. Dr. Greenberg is humbled by the opportunity, responsibility and honor of serving in the medical profession. Because of his double board certification in ENT and Plastic Surgery, Dr. Greenberg has developed a special interest in nasal surgery. He has performed a very large number of these procedures over the years, including correction of deviated nasal septum, obstructed nasal valves, rhinoplasty and fixing injured noses. He has also performed revision surgery for patients who are unhappy with the results of previous procedures done by other physicians. While these revisions are challenging, Dr. Greenberg has been able to help most patients breathe and/or look better. Besides ENT training at Manhattan Eye and Ear Hospital, Dr. Greenberg has trained and lived in Ohio and Illinois. He has been Chief of Plastic Surgery at Norwalk Hospital since 1996 and is a member of the Department of Surgery Executive Committee. Dr. Greenberg has reviewed problem cases for the State of Connecticut Medical Licensing Board as well as other state boards. Dr. Greenberg currently resides in Westport with his wife, Andrea, and two sons, now attending college. Son Joshua is continuing the family tradition and has been accepted to medical school. Dr. Greenberg is one of relatively few surgeons to be double board certified in both Otolaryngology and Plastic Surgery. 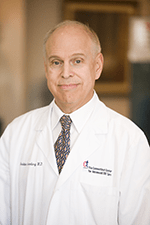 He has been Chief of the Plastic Surgery Section at Norwalk Hospital since 1996. He has extensive experience in both cosmetic surgery of the nose (Rhinoplasty) and surgery to improve breathing through the nose (Septoplasty and Nasal Valve Repair). He has performed more than 2500 nasal surgical procedures. Rhinoplasty is a surgical procedure designed to improve the appearance of the nose. The nose may be less attractive than the patient likes due to heredity or injury. Dr. Greenberg strives to create a new look for the nose that is both attractive and natural so that no one can tell that the patient has had surgery. Rhinoplasty is one of the few procedures performed by surgeons that deal with both appearance and function. Breathing well after surgery is very important. Revision Rhinoplasty is done when patients have had a prior Rhinoplasty that has left them with cosmetic or functional problems that need to be repaired. Many patients are still unhappy with the way their nose looks and/or have difficulty breathing through the nose. Many have nasal valve problems. Correcting these problems requires experience. Dr. Greenberg has done many of these procedures successfully. Septoplasty is surgery performed to correct a deviated nasal septum causing nasal congestion. It is the most common surgical procedure performed on the nose and can be done alone, or frequently, combined with Rhinoplasty. Nasal Valve Repair is performed to correct nasal valve obstruction or what is sometimes referred to as Vestibular Stenosis. The obstruction occurs at the narrowest part of the nasal airway and is frequently overlooked as a cause of difficult nasal breathing. Many patients have valve problems that cause their congestion rather than a deviated nasal septum. This is why many people have difficulty breathing through the nose even after a septoplasty to correct the septum. People who have trouble breathing after Rhinoplasty surgery usually have nasal valve problems as well. Other causes of nasal valve obstruction are aging and broken noses. Patients who are helped by pulling their cheek or using Breath-Rite strips have nasal valve obstruction. Permanent improvement requires surgery. Few surgeons have the experience in the procedures required to correct this problem, and therefore do not offer them to patients. Dr. Greenberg has successfully performed hundreds of these operations. Contact the professional care team at CT ENT Sinus Center, Treating patients from Fairfield County, CT, to Westchester County, NY.